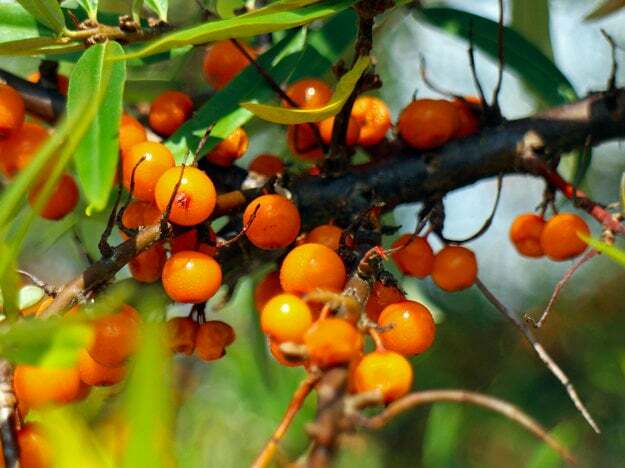 Sea Buckthorn oil is a particularly valuable ingredient when it comes to PURE SKIN FOOD facial oils. a particularly high level of vitamin E (tocopherol): This antioxidant stabilises biological membranes and protects the skin from the harmful effects of reactive oxygen species, especially those found in sunlight. beta-carotene (provitamin A) is a precursor of vitamin A and responsible for the beautiful red shade of Sea Buckthorn oil. It has anti-inflammatory effects on eczema or acne, protects the epithelium and plays a role in the regenerating process of the skin. Palmitic acid supports the function of the skin barrier. The polyunsaturated palmitoleic acid, an omega-7 fatty acid, prevents the formation of wrinkles and aging of the skin. provides strong protection against environmental influences.